Any Minecraft fan will tell you that taming an ocelot and keeping it as your pet cat will help scare creepers away, but do you know why creepers are scared of cats? It's because cats think creepers make a great scratching posts. 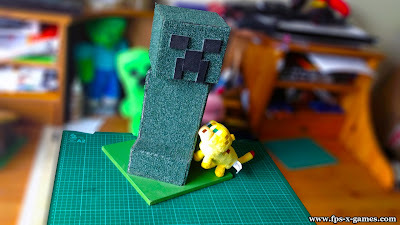 If you're a Minecraft fan and a cat owner, why not have a go at making a creeper cat scratching post. It's simple to make, costs about £15 and could be done in 1-2 hours. How to build a Minecraft Creeper Cat Scratching Post? First watch the video for a better understanding. Cut out your 18mm MDF 10 inch squared base and paint grass green. Next measure and cut wood for frame. Build and attach with superglue. Once the creeper frame is assembled, measure out the hardboard panels and glue using PVA, 10 mm staples or nail. Using the green tile carpet or string, line the creeper all over. Attach using a carpet spray adhesive or hot glue gun. If your tile carpet is black on the other side, use some scraps to make the creeper face and glue using UHU, or you could make a stencil and use black spray paint. This stage is optional; I used a motor from an old hard drive to make the head spin. Mount body to base and attach the head.